Developed for the high perfomance European tyre market and designed to be an all season edition of the popular Pirelli P6. This all season touring edition has ELRR (Extra low rolling resistance) and still manages to provide an incredibly smooth and comfortable ride, even on the sporty low profile editions of the P6 Four Seasons All Roaad. 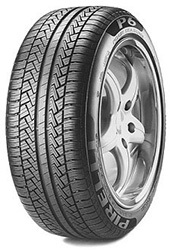 Asymmetrical tread design with two circumferential grooves on the outside of the tread pattern create an enviornment where water dispersal is rapid and allows grip and traction to remain firm through all wet weather. The siped silica compound used in the tread helps to ensure traction remains constant even when faced with snow and ice.